I'm always on the lookout for non-wasteful centerpiece ideas. We've talked about potted centerpieces that can go on living after the wedding, as well as food basket centerpieces that can be donated to food banks after the wedding. Today's topic: edible centerpieces! 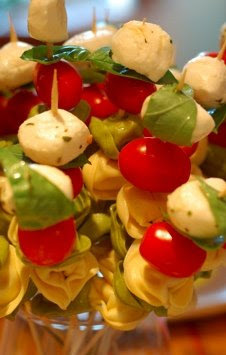 (Above) These skewers from Slashfood are arranged like flowers and made from tortellini, tomatoes, and mozzarella balls. 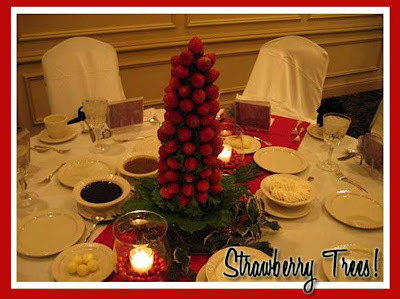 (Above) This edible centerpiece featured on Elizabeth Anne Designs is made with a styrofoam base and strawberries. Note the dipping sauces on the table. Yum! 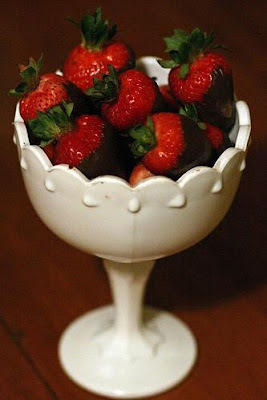 Or how about this simple, chocolate-covered strawberries centerpiece from this flickr photostream? (Above) This professional fruit arrangement is expensive but could be easily replicated. 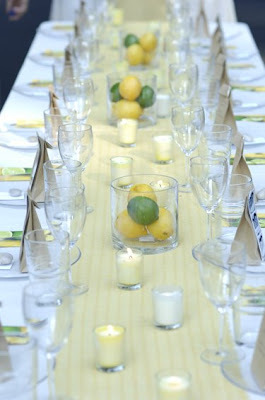 The amazing couple over at This Young House used lemons and limes for their centerpieces (above). 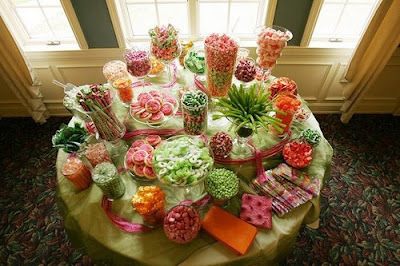 Another idea is to use candy for edible centerpieces. I've seen lots of candy buffets (like the one pictured in this flickr photostream) but I haven't seen it used as centerpieces. I think it would be best to use wrapped candy, so leftovers wouldn't go to waste. 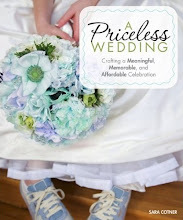 Just for the record, I think centerpieces are among the last things we should worry about as we plan meaningful and memorable weddings that focus on community, commitment, connection, and fun. 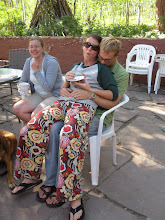 In fact, I've been to weddings (and restaurants) where the centerpieces are so big and distracting that they actually hinder community, connection, and fun because you can't see the people across the table! But if they are on your list of action steps, hopefully these ideas are useful. These are fab, and so yummy looking! Ours weren't edible, but they were reused and reusable-- I wrote a bit about them here on my blog. 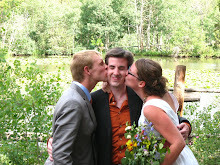 Yours is one of the few blogs I can stomach post-wedding, thank you! Oh, those are awesome. I think edible or even just using fruits/foods (lemons in a clear tall vase) etc... really brighten up a table and give you something slightly diff than the normal flowers! The whole concept of centerpieces was unknown to me until I started looking at American Wedding websites. I have been wondering what the exact purpose of these centerpieces is. Decoration probably, but when I go out to dinner, I never expect my table to be decorated with more than a nice tablecloth, napkins, cutlery, salt & pepper, perhaps some oil and vinegar. Yeah, the table will look empty when nobody is sitting down, but that is hardly the point. A table setting is not meant to look superb and impressive without guests, from my point of view. It's just waiting for the guests to fill it with half full wineglasses and plates of food. An occasional small flower arrangement is not bad (as long as it is not to fragrant, because that hurts the food- and wine experience), but it's the food and the people that count. I think for me a overwrought (flower)arrangement in the middle of the table indicates that you expect that one of these two (food or people) will not be good enough, so that the guests will need something to distract them from it. We're having cupcakes instead of a wedding cake, and our centerpieces will be cake plates with each table's allotment of cupcakes on them. 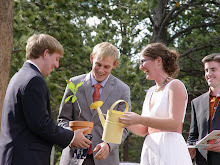 We want to make our wedding as sustainable and inexpensive as we can, but I confess that the main reason for the edible centerpieces is that I just don't like flowers. We're having a dessert reception- getting different kinds of really yummy cheesecake, and then having fruit & cheese plates. But instead of having a buffet line, we're making trays of the fruit & cheese, maybe putting a big candle in the middle, and using those as our centerpieces. Then people won't have to wait in long lines, and we don't have to worry about fancy centerpieces. It's very utilitarian- I like it. Wow! It's great idea the centerpiece with fruit. The color is really beautiful than flowers. Gorgeous! !